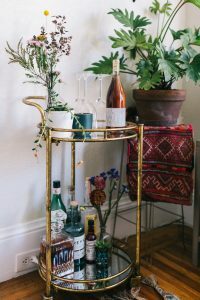 A few years ago, a friend gifted us with a rectangular gold bar cart and since, I’ve been obsessed with decorating the bar cart in different ways and moving it around in different areas of our apartment. 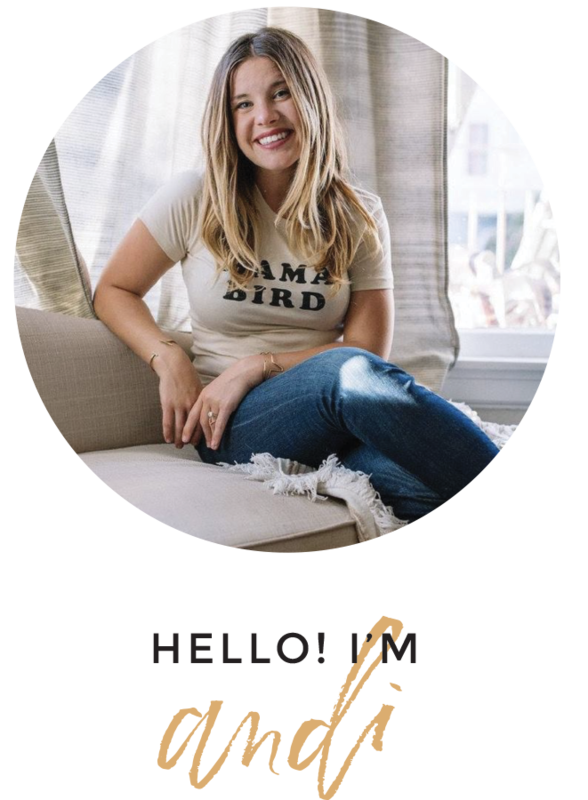 Today, I wanted to show you the newest bar cart in our little nest and share a few bar car styling tips. 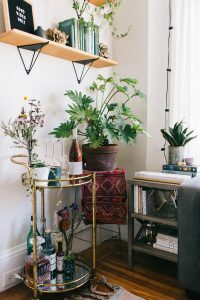 Recently, I received this cylinder gold bar cart from wayfair and I’m now having fun with the new decor challenge of styling this one in a different way. I moved the rectangular one into our kitchen, but might integrate into the bedroom in some way. For this new cylinder one, I placed it in our living room under our hanging shelves and next to a gold plant stand and big plant. In terms of what I’ve put on the bar cart, I’ve had to pair down the items since it’s much smaller! I like how this one is smaller so makes this particular corner in our living room a *little* less crowded, plus I like that each of the two tiers are mirrored. 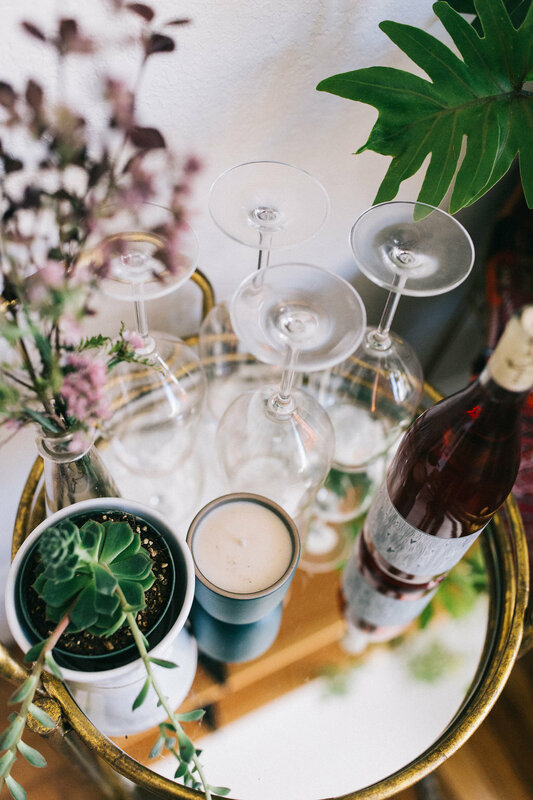 So without further ado, here’s some of my bar cart styling tips and tricks! Put the bottles with pretty labels front and center. My husband E has some really good bottles of whisky, but they didn’t make the bar cart cut this time because the bottle itself or label is just a little meh. Obviously, the whisky will still be enjoyed, but for now, the not-so-pretty bottles of booze are being stored in other spots rather than on this smaller bar cart. 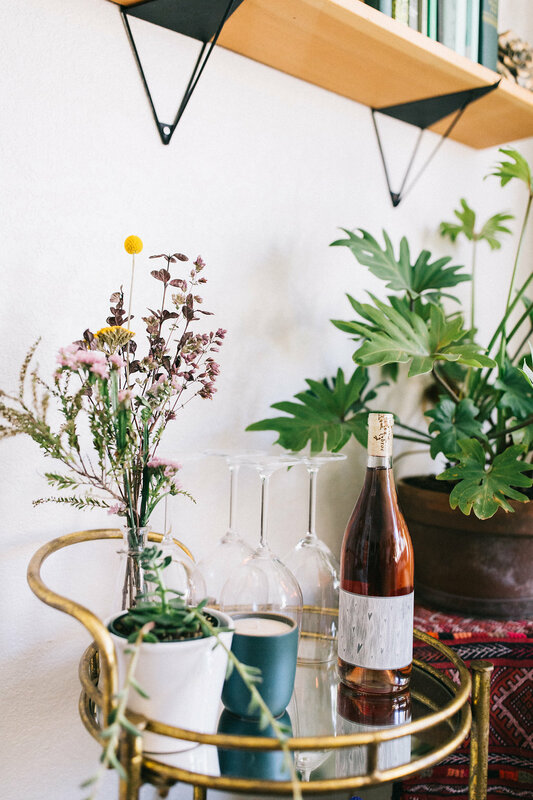 Interesting or pretty bottles of wine and liquor will make the cut! ? And/or, get a decanter. That leads me to my next point – one way you can display booze is in a unique or pretty decanter. There are tons of options from Wayfair, but the one I have pictured here is just from a flea market (another great place to find bar cart swag). 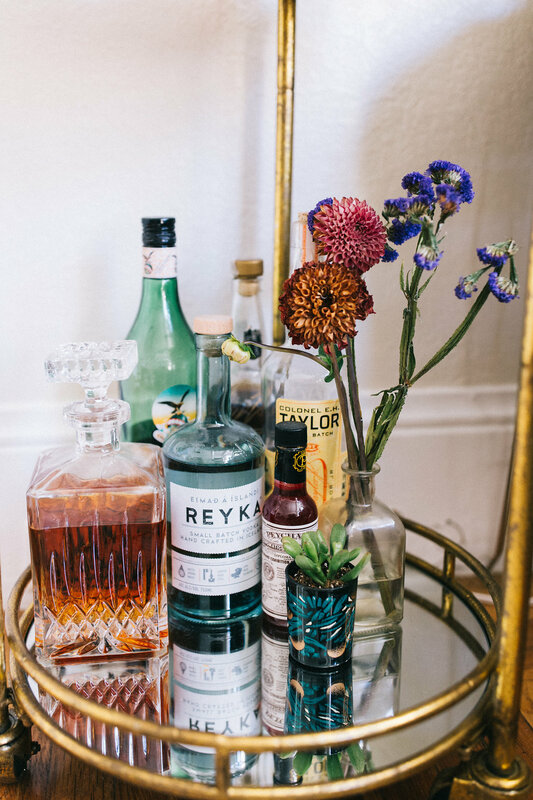 Decanters are a great way to not only store your liquor, but also add some personality and quirk to your bar cart, depending on the shape or size. Put pretty glassware on display. Since we tend to drink wine mostly, I have wine glasses on the top shelf of the bar cart for easy access. I have some pretty patterned gold champagne glasses on display too. If you’re more of a cocktail fan, I would recommend getting cool glassware, like short and tall glasses or cocktail mugs. ? 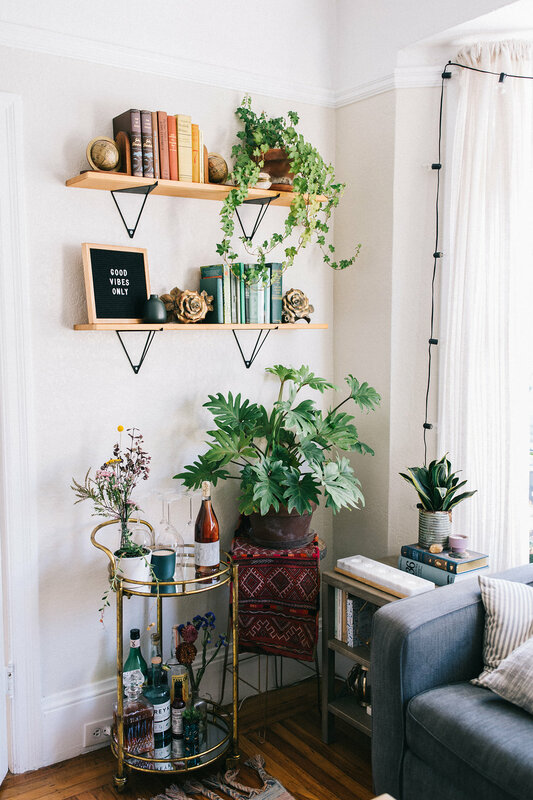 Add some greenery/florals. 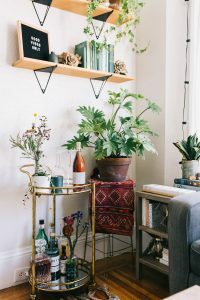 This advice isn’t exactly limited to the bar cart, because I always recommend more plants and flowers in all areas of the home. But, I definitely like when our bar cart has a small plant or some pretty blooms on display. ? 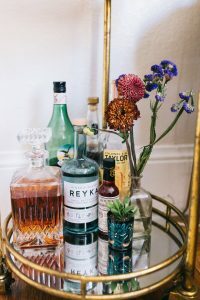 Mix in some non-bar related accessories: I like to have some non-bar related accessories on the bar cart so it’s not just screaming BOOZE and instead, feels like an integrated piece in the larger space. 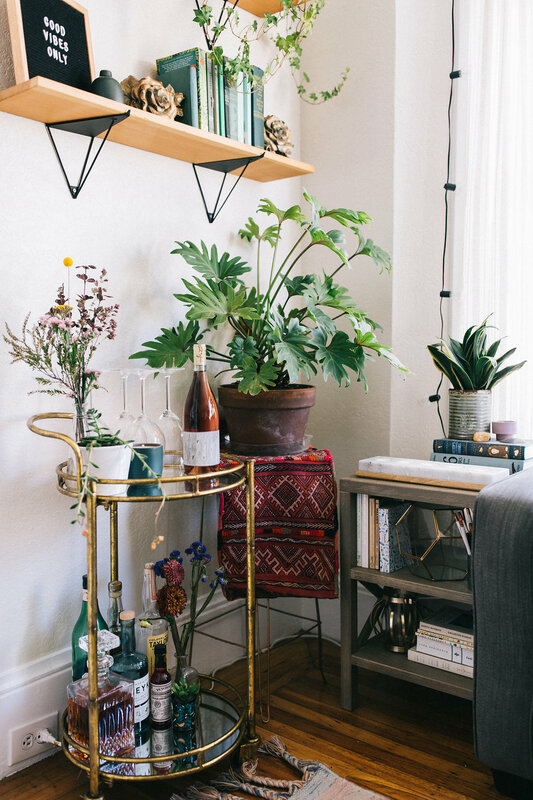 On the larger bar cart I had, I had a globe on the bottom shelf which I think added a bit of whimsy and tied into other areas of the apartment (as we have travel photos, maps, etc. on display). You could also do a stack of pretty books, a candle or other home goods that aren’t bar/drinking related. 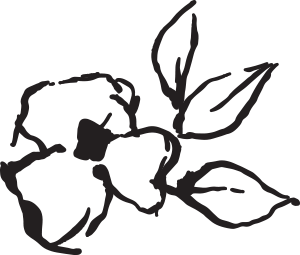 And, here’s a few more ideas just in case! Incorporate framed art. if this bar cart were a little bigger, I would add some framed art to the top shelf. I had a print in a gold frame from our wedding on the bar cart earlier that looked really good with the gold bar cart, but unfortunately it doesn’t fit on this one! Display cocktail making accessories – if you want to make your bar cart a little more functional (vs. more decorative like mine), you could add cocktail making accessories/gear like a shaker, jigger, ice bucket, strainer, muddler, etc. I would recommend storing these in a cute cup or bowl so they aren’t just haphazardly placed onto the bar cart. ? 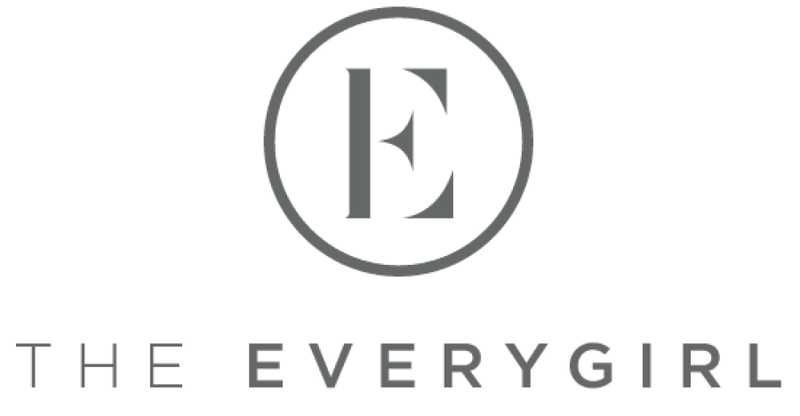 Store those “etc.” items. 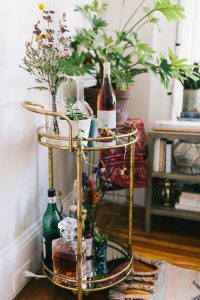 the bar cart is a great place to store coasters, fun cocktail napkins, a container of colorful or patterned straws, etc. Why not display fresh fruit? if you’re hosting a cocktail party anytime soon, why not put a small bowl of lemons or limes on display on the bar cart? 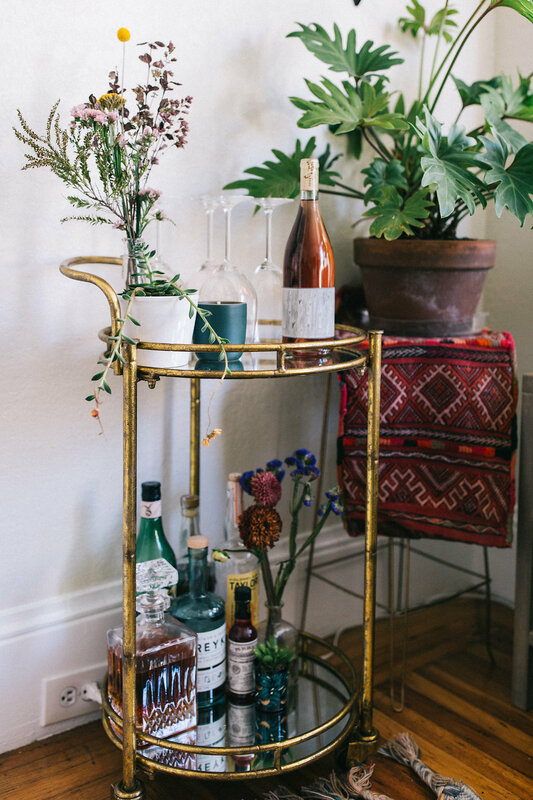 It’s a fun (and again, functional) way to add a pop of color to the bar cart. As mentioned, this cylinder gold bar cart is much smaller than some other bar carts, so of course, I couldn’t incorporate all of the ideas I shared above. But, hopefully they give you some ideas on how you might style a bar cart in your own apartment or house. 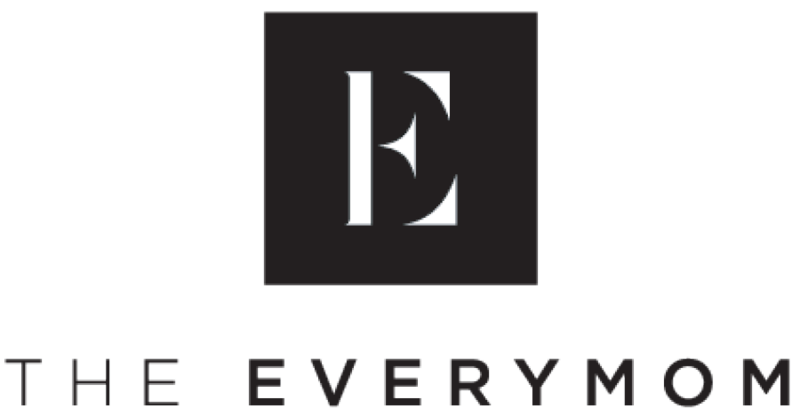 Thank you for reading and thank you wayfair for partnering with me on this post! 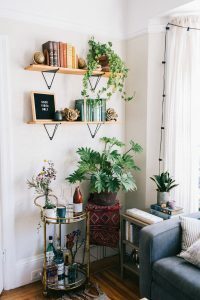 Love this and that gorgeous lil plant corner of your place!